Vista4Experts is a free tool that can help you disable some of Windows Vista’s annoying security features. It can disable some of the security features like security center notifications, User Account Control dialogs, automatic Windows Defender scans, automatic update installations and etc. 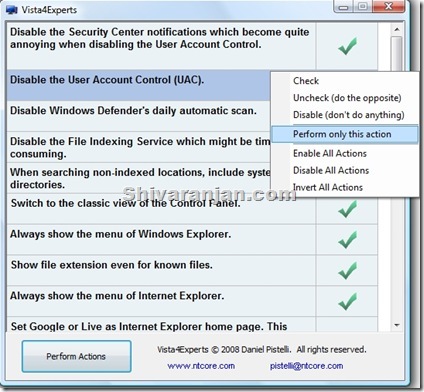 So if you are annoyed with some of the Vista’s security features then you can disable it with just few clicks. We personally feel this tool would be pretty useful for people who would like to have more control over their OS. Warning: If you do not know the implications of these changes then you may end up with unstable operating system that can crash and vulnerable to security breaches. Use this software at your own risk.